There’s nothing better than strolling into your home after a long day than to smell dinner cooking away for you and almost ready to eat. 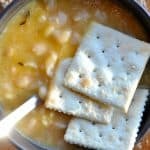 With minimal effort this Slow Cooker Bean with Bacon Soup recipe comes together with ease and cooks most of the day. This is a great soup for late winter when you want to be outside channeling water, cleaning up from winter and yet somehow you still have to make dinner. EVERY night. I happen to love throwing dinner in the crock pot at 10 am and knowing that dinner for the most part is done. Plus it smell like you slaved away all day when you really spent time playing outside or napping. Souper (HA sorry couldn’t help it!) easy and very affordable. This Bean with Bacon Soup recipe is so much better than anything you will find in a can. Oh I love the addition of the squash. I will definitely be trying this. I love soup year round. And I especially love cooking it for hours, so the house smells delectable!